We say pancakes, what comes to mind? Lemon, sugar, maybe a spread of nutella for good measure. Now forget all that, because in April we throw out everything you thought you knew about pancakes. Leave those lemons at the door. Spring is often the herald of new beginnings and here at 1000 Trades it’s no different. We’re proud as punch to be welcoming new chef Andrew Gabler to take the reins of our kitchen, with six months of unparalleled menus that even the proverbial hare couldn’t keep up with. Andrew spent his first eighteen years growing up in Barbados soaking up a love of and passion for food from relatives, a passion that he brought to the UK. He earned his culinary stripes with a stint at the Victoria, joining the opening team Bodega in the city centre, and putting his soul food stamp on The Church in the Jewellery Quarter. We were impressed too. Inspired by a love of the American diner, Twisted American Pancakes – T.A.P – is Andrew’s first menu creation. 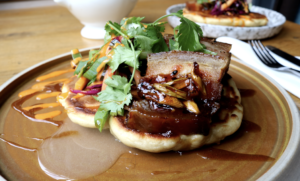 Not your ordinary pancake, these savoury specials are served up with BBQ rib, vegan curried cauliflower, and yes, there’s a sweet dessert pancake for good measure. We’re known at 1000 Trades for not strictly adhering to tradition (wine on tap anyone?) so we knew this was right up our street – and we know you’ll love it too. “I’m so pleased to be joining the team at 1000 Trades in April, putting my passion and love for food onto the plates of the Jewellery Quarter. “T.A.P is a homage to the drive-ins and diners of the US. 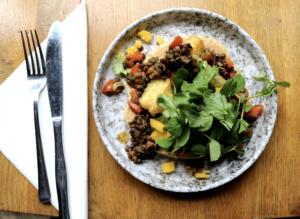 This menu is exactly what I want to be doing: mixing things up, letting the creativity shine through, and offering something different to the norm in Birmingham. “Flavour is key. Everything has to taste amazing and I hope diners will agree with these pancakes that’s what we’ve achieved. We’ve got something for everyone, from BBQ short rib to vegan curried cauliflower and crispy courgette. If that’s not enough there’s dessert too. T.A.P will be at 1000 Trades through April, for lunch and dinner. See the full menu here and book a table here.